According to a recent article in Clinical Biomechanics, plantar fasciitis (PF) is the third most common injury in runners. As well as being common, PF can be difficult to treat and resistant to a host of different approaches. It also tends to be ‘self limiting’ which means it can go away of it’s own accord but that can take over a year. So in today’s blog we’ll look at causes of PF and how you can treat it. The exact cause of PF is poorly understood. It is thought to be an ‘overload’ problem, like many other problems in running and yet it’s quite common in fairly sedentary people. The plantar fascia itself is a tough band of fibrous tissue that extends from the heel bone to the metatarsal bones of the foot. It supports the longitudinal arch and takes a lot of load during walking and running. I should point out that this isn’t a condition that usually involves inflammation so the term Plantar Fasciitis is probably inaccurate. It’s though the response from the tissues is actually similar to that of tendinopathy and involves a range of changes including swelling of the fascial attachment and breakdown of the usual collagen based structure. As such some people term this plantar fasciopathy or Plantar Heel Pain. Credit to Kosi Gramatikoff, who has kindly made this image freely available. Pain tends to be felt in the sole of the foot with tenderness on palpating (feeling with your fingers) the medial tubercle of the heel bone (as shown in the diagram above). Often the first few steps in the morning are painful but this gradually settles as you continue walking. Running, walking barefoot or on your toes and going up stairs all tend to aggravate the pain. X-rays, MRI’s and other investigations are thought to be of limited value for PF. Usually it can be diagnosed through a patient’s history and examination. Occasionally further investigation may be requested to rule out a differential diagnosis (i.e. something else that could be causing the pain). X-ray may reveal a “heel spur”, these are said to be present in around 50% of patients with PF, but are also present in around 20% of people without PF so the presence or absence of a heel spur is not helpful in diagnosing PF. As mentioned above the exact cause of PF isn’t well understood. It can be present in sedentary, overweight individuals or very fit active runners. Generally though it is thought to occur when there is an increased load placed on the plantar fascia, either by certain activities (like running) or by a patient’s biomechanics, or a combination of both. Biomechanics – PF has been associated with both a low arch and a high arch. Any biomechanic factor that increases the stress on the plantar fascia may have a role, this can include overpronation and leg length discrepancy. This goes hand in hand with control issues – poor control of movement at the knee and hip is often associated with overpronation. Typically overpronation is accompanied by hip adduction (moving toward the other hip) and poor impact control. Tissue tightness – the most common cause is often considered to be tight calf muscles. The Achilles tendon blends with the plantar fascia so if it is tight it places greater stress on the fascia. Most treatment regimes involve gastrocnemius and soleus stretching as a result. The plantar fascia itself may become tight and specific stretches have been recommended for this which will be described later in the article. Footwear – Old or inappropriate footwear can lead to increase stress on the PF and cause pain. So what do we recommend? This is where PF can be confusing. We’ve said it can be caused by overpronation so you’d think a stability shoe that prevents overpronation would help. Sometimes it does, sometimes it actually makes it worse. The reason for this is that the arch support in the shoe can push into and irritate the fascia, especially if it’s already sore. Shoe selection for managing PF can be tricky. In theory a combination of support and cushioning would be ideal. Support the fascia without irritating it. I can imagine a full on motion control shoe might be too much. Also a shoe with a reasonable heel-to-toe drop (explained nicely here by runblogger) should in theory reduce stress on the plantar fascia. As ever with shoes I say in theory because everyone seems to respond to shoes differently. The only way to find out is to run in them. If you are running in flat or minimalist shoes these could also cause or aggravate PF. Due to the much smaller (or non-existent) heel section the ankle may be required to dorsiflex more during the impact part of running. This places greater stress on the Achilles and plantar fascia. This of course does depend on your running style and form. If you have recently changed your shoes or are trying to graduate into minimalist running this may be the cause of your PF, especially if you haven’t made this changed gradually. Some shoes are designed to control foot position through the heel, they have a “heel counter” or, in some, a “rearfoot posting”. This means a wedge shape under the heel to control it’s position. It might be preferrable to support at the arch. If you have high arches the foot tends to be less flexible and this can lead to PF, usually the priority then is a cushioned shoe, rather than support for the arch. When it comes to shoes, runblogger is your man! I’ll see if he has any specific recommendations for PF, and update the post if he has. Muscle weakness – Research has suggested that weak calf and intrinsic foot muscles could both place greater stress on the plantar fascia. The calf muscles are involved controlling impact and preventing excessive dorsiflexion and intrinsic muscles of the foot help to support the arch. Tibialis Posterior also has a role in supporting the arch of the foot, so in theory, a weak tib post or PTTD could also be factor in PF. Progressing straight to stretching may aggravate your pain, firstly aim to settle your symptoms a little if you can. In the acute stages there can be inflammation within the fascia and so a course of NSAIDs or application of an anti-inflammatory gel might be helpful. Your RICE or POLICE principles come in handy – namely rest from aggravating factors such as walking barefeet, running or prolonged standing. In mild cases you may be able to modify these things (e.g. Just running as far as is pain free or using different shoes) rather than resting altogether but this is the subject of some debate. Some people use a mantra of, “no running until pain free”. You can also try to offload the plantar fascia. This can be done using low dye taping and research has suggested it reduces peak plantar pressures. I also use a technique using kinesiology tape to support the arch – see video below. A more simple approach is using a gel heel pad or tuli cup. There are a huge variety of them available and I wouldn’t specifically recommend one type, although Orthaheel appear to popular on the RW forums. The best test is to go to the shop, put them in a shoe and walk with them and see what happens to your symptoms. You would expect at least some immediate decrease in pain if they are likely to work. Off the shelf orthotics (insoles) can also help, again there is a huge variety out there. The research I’ve read favour a flexible insole with cushioning under the heel. You could also see a podiatrist for a custom made orthotic but, from what I’ve read on the subject, the evidence didn’t suggest they are more effective. In time, when symptoms settle, you should be able to wean off gel pads or orthotics. Keep them handy though in case of a flare up. However, if you have significant problems with your foot posture it may be wise to stick with your orthotics, especially if they are really helpful. Probably the most widely recommended treatment for PF although we lack high quality evidence to support it. If calf tightness is an issue for you try stretching both muscles; gastrocnemius (top in the picture) and soleus (at the bottom). Hold for 30 seconds 3-5 reps, 2-3 times per day. In both cases the leg at the back is the one being stretched. With both these stretches it’s a good idea to turn the foot in or out a little, as well as stretching it with the foot pointing straight forward. We don’t move entirely in straight lines so it makes sense to vary these stretches a little. Another way of doing this is the “ultimate calf stretch” which stretches the calf and includes some rotation. It is quite an aggressive stretch though so be cautious with it. You can also help release tightness in the calf using a foam roller. This is often painful at first but improves if you persevere. Cross the leg of the affected side over the other leg. Grasp the toes and stretch the toes upward as shown in the photo. You can also feel along the plantar fascia with your fingers to make sure the area is under tension. The link above has more details on this. Hold the stretch for 10 seconds, repeat 10 times. Do 3 times per day, including before you take your first steps in the morning. Stretch the mid foot over a cold or frozen bottle/ can (beware of ice burn doing this). Place a gentle pressure down on the can/ bottle stretching the middle of the foot and roll it backwards and forwards for approximately 10 minutes. Stop if too painful. You can also use a pedi roller for a similar effect, people on the RW forums have said they found them helpful. Strengthening the calf muscles can be tricky to do without aggravating symptoms. At first start with calf raises on both feet, in supportive shoes. Then progress to single leg calf raises. Do as many as comfortable and stretch after. As symptoms settle you should be able to do 2 or 3 sets of around 20-25 reps. Finally you can progress to doing this bare feet which will challenge your intrinsic muscles as well. Strengthening intrinsic muscles of the foot. A common exercise for this is using the toes to pick up marbles or scrunch up a towel. The Roxas study, linked above, has details of this. I’m not sure how effective they are in building muscle strength but they are widely prescribed. The AFX might also be an option for this as it is designed to strengthen the intrinsic muscles of the foot as well as the calf. They have a freely available exercise programme online as well as a video for PF here. Have a look at you single leg balance and single knee dip control. Check for overpronation or hip adduction (moving the thigh inwards towards the other leg) especially during single knee dip. More details on assessment and rehab of control issues here. These are designed to place a stretch on the Achilles and plantar fascia overnight. I have heard of people making their own using welly boots or by strapping a big comb to their foot! Apparently the big comb worked quite well! You can of course by an actual night splint instead! Their success is rate, like most things in PF, is quite variable. The research showed mixed results, some studies suggested night splints were effective in up to 80% of cases while others showed no change. The use of an injection really should be a last resort. Steroid is a potent anti-inflammatory so works well when inflammation is present. There may be some inflammation in acute PF but in more chronic cases it is thought to be a more degenerate condition, like a tendinopathy, with minimal inflammation. The structure of the fascia changes and becomes less effective in managing load. If this is the case an injection is very unlikely to help and injections have been associated with rupture of the plantar fascia. As I understand it, ESWT is a machine that delivers sound waves to the tissue and in theory this helps stimulate the healing process. It’s not a treatment I’ve ever used or recommended. That said I have heard some people get results from it for PF. The research into it has been largely inconclusive (as it is for most things!) and there is said to be a large placebo effect. The National Institute of Clinical Excellence has produced some guidelines on this, including some discussion of the research. ESWT may be an option for you if self management with stretches etc is not helping. This can be a challenge with any injury, and especially so with PF. Try and find a way to run pain free. This might be shorter distances, running slower, smaller stride lengths etc. or using tape, gel pads or orthotics. Gradually increase your distance and avoid hills initially. Ideally it should be pain free when running and for around 48 hours after. If your pain increases in this time or the overall trend is that it’s getting worse, you may have to rest until it’s more settled. Some people will continue to run with PF and others will wait until it’s resolved. It’s up to you! Sometimes PF can take a year to settle and resting from running doesn’t seem to help. In which case you may just want to gradually return and see how you get on. If, however, the rest seems to really help, and any runnng really aggravates it, it’s sensible to give it a little longer to settle with rehab before running again. I’m afraid there are no hard rules with this. More information on a graded return to running here. Prior to running it’s important to loosen the calfs a little with a dynamic calf stretch. Ultramarathon runner Andy DuBois has an excellent videoblog on this. After your run, use your calf and plantar fascia stretches as part of your cool down. Final thoughts: Plantar fasciitis can be a challenging condition to treat. Try and identify the cause and rectify it. Remember treatment should be based on your needs rather than generic advice. Rest or modifying training, ice, offloading and anti-inflams may help to settle symptoms. Also consider stretching the calf and fascia, and strengthening the calf and instrinsics. Return gradually to running with a dynamic warm up and stretches after if required. 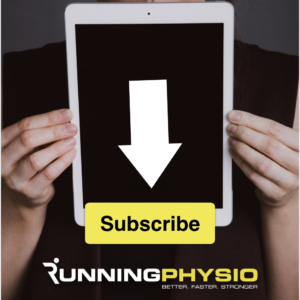 And….as ever on RunningPhysio…if in doubt get it checked out! I had a problem with PF. I also had a bad ankle sprain. I purchased the AFX (ankle foot maximizer) to rehab back from my sprain. Not only did it help my recovery, but it also solved my PF pain. I have no more foot pain after years of suffering thanks to AFX. I am now fully back and playing roller derby! Excellent! Glad to hear AFX has been such a big help and got you back running. That is great, I love to hear stories about how AFX helps get people back to doing what they love… and even better, this is our first Roller Derby testimonial! Thanks very much for sharing. I get heel pain on and off which I would classify as mild PF. Has never stopped me from running, and has never been much more than an annoyance for the first few steps in the morning. I suspect mine is mostly due to tight soleus muscles which I paid no attention to for too long. Things that have helped me are going zero drop in my casual and work shoes (helps keep the calves from tightening up), foam rolling my soleus and gastrocs, and having some ART to work out some knots in my soleus. As for shoes, I know a few people who have said that the Skechers Go Run seems to help with PF. It’s a pretty soft shoe, but has a raised area under the midfoot that puts pressure under the arch that seems to be of benefit. Not sure the exact reason why. Nice article. Plantar fasciitis is one of the more common issues I treat. I see great results with deep tissue fascial massage, foam roller therapy, and corrective exercises to strengthen the feet, hips, and core. I generally see significant reduction in the symptoms of pain within 2-4 sessions. Here is an article with some self massage exercises that should help with plantar fasciitis. This is probably the most complete overview of PF that I have seen online. In particular, your caution regarding steroid injections (usually avoidable) is important. Your comments regarding custom orthotics are particularly apt. Studies have shown time after time that custom orthotics have virtually NO ROLE as a primary treatment for PF. Despite this, patients frequently pay $500 out of pocket for unnecessary orthotics. Finally, the concept of continuing training despite continued (not disabling) discomfort will encourage a lot of avid runners to continue to participate while they recover. Thanks so much for your comment, you’ve just made my day! Markus Walther, Bernd Kratschmer, Joachim Verschl, Christoph Volkering, Sebastian Altenberger, Stefanie Kriegelstein, Marc Hilgers. Hope it’s gets better soon, feel free to ask questions via the comments sections and I’ll do my best to help! Thank you for ths great article, I’m a research physio not in musculoskeletal and have been looking for good evidence based care – thank you. I have PF following a fractured toe and slopping around in too big for me Uggs (the fracture didn’t allow anything else). Heel pain started up but I ignored it as we were going through a sudden bereavement at the time. Now 4 months on I’m in big trouble. GP wanted to inject but I refused. Despite not being MSK I had it in the back of mind that steroid injection was useless for PF. That was this morning and I’ve been researching ever since. Love your article and video – excellent. Thank you and I will start straight away. One question – stretching is painful – how far do I push this? Which stretch hurts? The evidence behind stretching isn’t great but there seems to be more evidence for the specific fascia stretch I’ve mentioned than standard calf stretches. If stretching hurts and aggravates the pain after I would focus on other strategies until things settle a little. Sometimes stretching in the early stages can make things worse. PF is an issue that usually involves excessive tensile load on the fascia, sometimes it doesn’t help to add to this load by stretching. I think there is a time for it and it’s usually in the more chronic stages. Recent Meta Analysis of RCTs show that the evidence for ESWT use in chronic plantar heel pain (>3 months) is becoming pretty conclusive. What is somewhat concerning is the wide range in treatment costs for this therapy. Some clinicians are charging upwards of $1500 US for the treatment regime. Compare this to $225 AUD for the exact same treatment. I think as ESWT units become more affordable and treatment costs continue to fall ESWT will become a widespread treatment choice. I’ve had Plantar Fasciitis in both feet and I couldn’t seem to find any relief from the pain. I took 5 shockwave therapies till now and have been stretching exercising and putting night split, ice rolling, shoes. And I couldn’t even walk without pain. I’ve been using MEDICOVI Twin-heels orthopedic insoles. There’s extensive information for patients on their page – http://www.medicovi.com It’s a new type of orthopedic from Scandinavia, Denmark. I’ve been using theese for months now and I’ve just bought my second pair. I’ve always suffered from pain in my feet, especially around the heels. Since owning these my life has literally changed. I can now walk with a smile on face. Can’t recommend them highly enough. Thank you for your article as I too have been suffering for well over 18 months. I had to stop running about 12 months ago because I just couldn’t walk for several days afterward and it wasn’t worth the pain. I also have 3-young children that don’t afford me the opportunity to sit on the couch or keep my feet elevated for days on end, not that anyone can do that! After 6 months of slowing down, not running and icing my feet with no relief I decide to start aggressively treating the symptoms. In that time I’ve seen a podiatrist, had xrays to confirm heel spurs in both feet, custom orthotics, deep tissue massages, PT sessions with dry needling, KT-taping, massage, ultrasounds and mild ESWT treatments (twice a week for 2-months). I’ve also iced, stretched, started Pilates, used heat therapy on hips, thighs & calves to loosen the muscles to help my feet, golf balls, foam rollers, new shoes, night splints etc. I even recently tried a round of Acupuncture on my legs and feet to relieve the swelling and pain. I have to say everything worked for a few days but nothing has really stuck for an extended period of time- for me anyway. My right foot has made drastic improvements but my left is still very inflamed and seems to be progressing very slowly. All in all, both feet are better than when I started this journey but definitely not where I’d like to be…minimal pain. After much hesitation, I finally broke down and received my first Cortisone injections last week in both feet. My right foot which has been reduced to minor pain through the series of events listed above & seems to be responding well and the pain is at a minimum but not completely gone. My left foot…well, its still not great. The Podiatrist indicated the shots may take a few days to actually start relieving the pain but I’m scheduled for a follow up next week. Needless to say…very frustrated! I’ve pretty much done it all, tried everything (not at once but introduced new procedures/techniques every 2-3 weeks if the last one did not work). After reading the entries above, I think I will try the heal inserts to see if the cushioning makes any difference but would love to hear of any other tips or techniques that may be helping others- different shoes, other treatments, etc. Thanks for letting me vent…hopefully my feet will find some relief in the coming weeks.